JewishWorldReview.com | When Saddam Hussein invaded Kuwait in 1990 and claimed it as Iraq's "19th province," Margaret Thatcher stiffened the spine of the first President Bush with a famous exhortation: "This is no time to go wobbly, George." Bush didn't go wobbly. Instead he assembled a great military coalition, which liberated Kuwait early the following year. What will it take to stiffen Barack Obama's spine? As Vladimir Putin engineered a Russian conquest of Ukraine's Crimean peninsula this month, the Obama administration met his belligerence with little more than scowls and tsk-tsks. The president and secretary of state repeatedly objected that Russia's power play was out of place in the modern world. "It's really 19th-century behavior in the 21st century," complained John Kerry, as if rapacious land grabs went out with clipper ships and corsets. The White House stuck to that line on Sunday, after Crimea's rigged election to secede from Ukraine: "In this century, we are long past the days when the international community will stand quietly by while one country forcibly seizes the territory of another." But by now Putin knows better than to take anything this administration says seriously. Sure enough, the monetary sanctions Obama ordered Monday were so ludicrously minimal  they targeted only 11 individuals, bypassing Putin and his top financial backers  that Kremlin insiders laughed. Russia's deputy prime minister tweeted that "some prankster" must have prepared Obama's sanctions list. The Russian stock and currency markets, the Washington Post noted, "both spiked upward in celebration." If the White House imagined that this was the way to get Putin to back down, clearly it miscalculated. Within hours of Obama's sanctions announcement, Russia formally recognized Crimea's independence from Ukraine. Yesterday, Putin signed a treaty annexing Crimea. This is no time to go wobbly, but when it comes to foreign policy, wobbly is what Team Obama does best. (See under: Red lines, Syrian; Poland and Czech Republic, missile-defense agreements; Iran sanctions, weakened; US military, slashed.) To be sure, "wobbly" isn't the word the administration would use. It prefers terms like "flexibility" or "reset." Yet from the Kremlin's perspective, the bottom line is crystal-clear: American leadership in the world is weaker than it has been in decades. Whether that is the result of war-weariness, ideology, or naivet�, the effect is the same. Garry Kasparov, the former world chess champion who now campaigns for democracy and human rights, wrote the other day that the West "has become so risk-averse that it would rather fold than call any bluff, no matter how good its cards are." And Putin is a cold-blooded poker player. 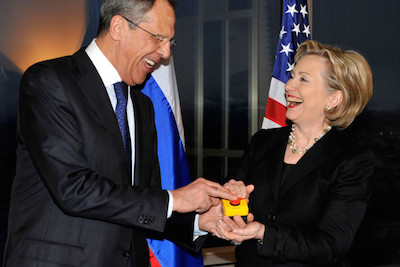 Then-Secretary of State Hillary Clinton presented Russian Foreign Minister Sergei Lavrov with a red "reset" button symbolizing the Obama administration's desire to put US-Russian relations on a new footing in 2009. The Russian word on the button actually meant "overcharge." No one expects or wants the United States to go to war over Crimea. But when will it dawn on the president that a US foreign policy based on retrenchment and accommodation makes the world more dangerous, not less? With the best will in the world, the United States cannot retreat from confronting the planet's bad actors and expect them to reciprocate in kind. Timidity is provocative and invites aggression. The way to discourage hostile regimes is through strength and resistance, not sotto voce promises to be more flexible, or lectures about "19th-century behavior." It is ironic that a president who came to office repudiating George W. Bush's policies has replicated one of his most unfortunate blunders. Russia invaded Georgia in 2008, and seized two regions of the country (South Ossetia and Abkhazia) that it controls to this day. Bush responded with little more than a scolding. Russia's "brutal" attack on its neighbor, he said, "is unacceptable in the 21st century." Had the United States backed Georgia then with more than mere words and forced Russia to disgorge its conquests, might Putin have been deterred six years later from hatching his Anschluss with Crimea? All we know for sure is that Russia paid no price for its illegal aggression against Georgia, and so far it has paid no price  other than Obama's paltry sanctions  for its raid on Ukraine. Like bullies and thugs from time immemorial, Putin will keep finding new victims to target. The more he is allowed to get away with, the more he will demand. You don't have to go back to the 19th century to know that it's folly to try to appease the unappeasable.